Create an unforgettable Easter basket this year for your little one with some of the latest Schleich figurines. Bring life to the Easter basket with realistic miniatures from Schleich, they are perfect for the curious lil' animal lover in your life. A couple of cute sets that are perfect for the Easter Basket are the My first farm animals set and the Feeding on the farm set! The farm animals are exploring their new home and sniffing their surroundings curiously. The pig jumps up with delight – its keen sense of smell has led it to some apples and carrots. It devours them, munching happily. The farmer feeds the hay to the Black-Pied cow, which is already mooing hungrily. The cute little lamb is allowed onto the pasture for the first time today. The way it prances around is hilarious to watch. The hen watches the goings on with interest from the farmyard, and occasionally pecks at grains of corn. The set includes a Holstein cow a pig, a sheep, a hen, a bale of hay, green apple and a carrot. I remember playing with similar sets as a child. Who doesn't love a farm set. The hen, bale of hay and sheep each fit perfectly in larger plastic eggs. 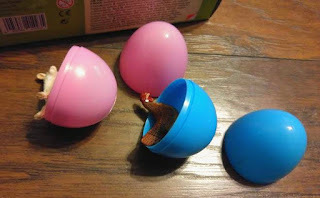 Then place the smaller accessories in smaller eggs. Kids will love opening the eggs to discover the figurines inside. 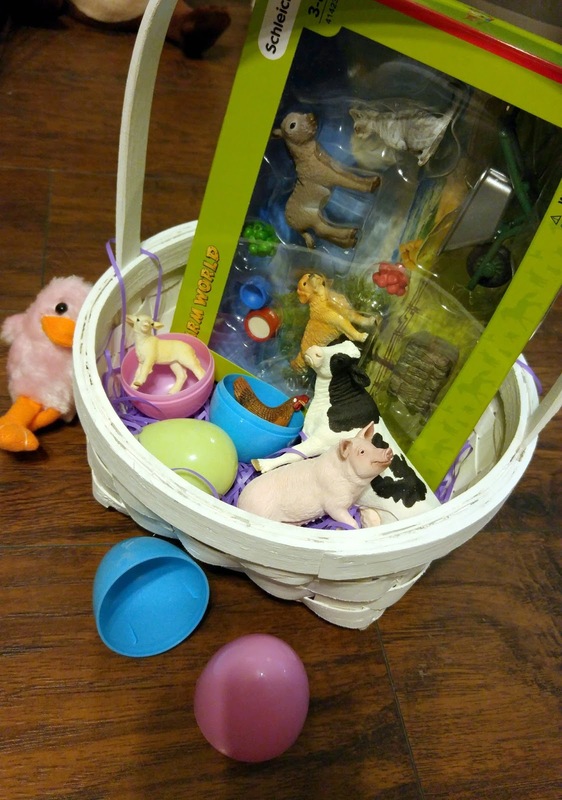 Place the bigger figurines in the basket with the eggs. You could even pair these sets with a cute farm book! Purchase Schleich North America My First Farm Animals Toy Figure on Amazon for $15.98 & FREE Shipping on orders over $35. Plus there is a 15% off coupon available which makes it only $13.58! The animals at the farm are hungry and are already waiting impatiently for their feed. The donkey foal can also hardly wait for the farmer to bring it a wheelbarrow full of hay. Donkeys are extremely calm and even-tempered, making many animals feel safe and at ease around them. In order to ensure that the young donkey foal grows up quickly and healthily, it gets good-quality hay and is regularly treated to fresh apples. The Golden Retriever is also already looking forward to its delicious feed, and wags his tail when he sees the bowl full of food. The farm cat hunts its own food and catches mice. This protects the strenuously harvested crops and prevents the little rodents from eating them. 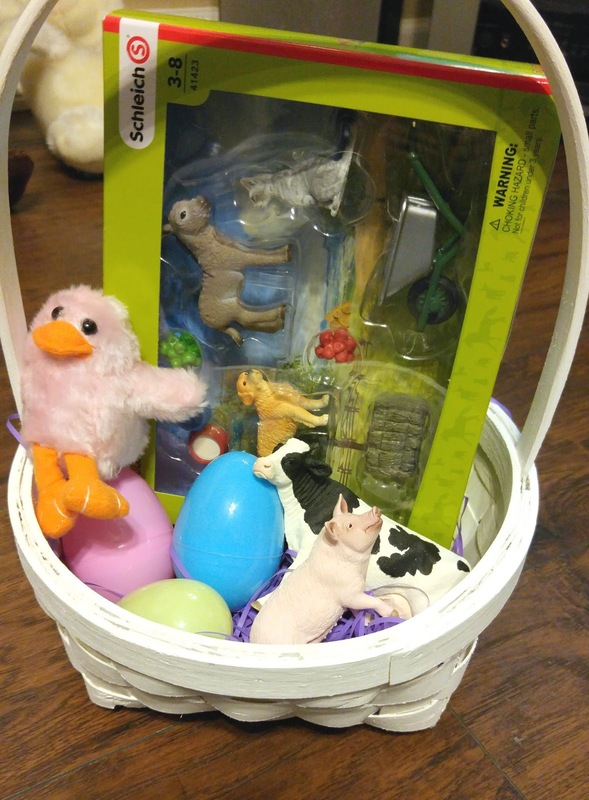 This fun kit includes a donkey foal, a cat, a golden retriever, a water and food dish, a bale of hay, green apple, red apple, and a wheelbarrow. Seriously, the donkey is one of the cutest figurines ever... but then again, I love donkeys! These figurines have some much detail and texture. Kids will love this set with these cute animals and accessories! The are prefect for imaginative play and will give kids hours of fun! Purchase the Schleich North America Feeding on The Farm Playset on Amazon for $16.08 FREE Shipping on orders over $35. Plus there is a 15% off coupon available which makes it only $13.67! Schleich figures are available from Amazon, Target, Meijer, Schleich Toy Store and Toys "R" Us!